Ian Hardy (son of Club member David Hardy) has made his photos taken at Setley Pond available on the photo sharing site “smugmug” where you can view his photos in super high resolution. Ian’s photos have also been added to albums on this site: Archie Howie’s HMS Illustrious, Brian Rapley’s Uboat U47, Jeff Stone’s Smit Rotterdam, John Andrew’s Anteo, John Will’s Monichetta, and Ray Hellicar’s Smit Rotterdam. 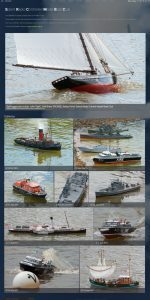 Ian’s photos have also provided new albums which feature Brian Rapley’s Trent Class lifeboat RNLB Samarbeta, David Hardy’s Jubilee cabin Cruiser, and John Frost’s Perkasa. Club member John Andrews has added new albums for his Falmouth working boat Mi’andsome and for a cruising yacht Qwyver – a model of his own yacht of the same name. Meanwhile, Peter Taylor has been lurking around the pond and created photo albums for Dennis New’s Tyne Class lifeboat RNLB Hilda Jarrett, Keith Young’s Joffre tug boat, and Ken Dyer’s metal cargo ship Tin Tin. At present many of these albums feature on the “Recent Scale Section Photos and Movies” page. It’s worth having a look!